Mayor Menino will use the event to announce a new initiative to dramatically increase tree canopy cover in the city, as well as a partnership with the USDA Forest Service to launch the nation’s first Urban Research Forest. With the “Growing Boston Greener” initiative, the city is setting a goal of increasing canopy cover by 20% by the year 2030. This is a significant undertaking, and will require the planting of over 100,000 trees between now and 2020. The initiative will focus on addressing environmental justice concerns by planting trees in areas with low canopy cover, and on mitigating urban heat islands, and will include plantings on both public and private property. For more information, visit the Grow Boston Greener website at www.cityofboston.gov/parks/streettrees/growboston.asp. Residents of Union Square in Somerville are organizing to have a say in the zoning changes that will allow taller buildings and denser development in their neighborhood. They decided to write their own zoning petition as an alternative to the city's proposal, which the group submitted in March. Stuart Dash, director of community planning in Cambridge and a member of Union Square Neighbors, wants to ensure that building setbacks are appropriate and buildings gradually increase in height. The city's original zoning proposal, which called for 140-foot buildings, would create a "darker, less personal" square, he said. The 100-foot limit would be better, but "it's not as far reduced as we would like to see it," he said. Vickie Choitz bought a home in Union Square in 2005 in part because she knew it was an area that would be redeveloped. She said she is concerned that multi story development in the area could put her home, partway up Prospect Hill, in a valley. "We don't necessarily want to preserve Union Square as is," she said. "We're not afraid of development. We want it to be done in a way that isn't giving away the farm of Union Square and telling developers you can do whatever you want." Who does Mark Trachtenberg think is running for City Council? Today's Globe editorial highlights the difficulties that many people have affording home ownership in Boston. Another reminder (like the one from earlier this week) about how we should look at opportunities to rebuild and revitalize Western Ave and the Holton St Corridor. New York is joining cities including San Francisco, Vancouver, Seattle, and Portland by installing "bus bulbs" in an attempt to ease traffic congestion and improve public transit. Basically, a bus bulb is an extension of the curb into the space usually reserved for on-street parking. It is used when there is not a dedicated lane for buses, but when buses share the lane with regular traffic. The bulb seems counter-intuitive because it causes the bus to stop in the travel lane, and therefore cars behind the bus also need to stop. But studies (like this one from the Federal Transit Administration) suggest that this delay is more than offset by eliminating the delays that are caused by buses slowing traffic when they pull out of and back into the travel lane when they stop at a traditional bus stop. Some people interviewed in the Times article are skeptical about this approach. But it is at least worth considering as Harvard talks about a need for dedicated shuttle bus lanes and we also want less pavement and narrower, more human scaled streets in the future of our neighborhood. "A new commuter rail station could be in the works for Allston. Boston City Council recently voted to support a grant to study comprehensive traffic management plans for the city, which could involve building such a station in this neighborhood." This is a surprise. I have never heard about this project - has anyone else in the community? How does it fit in with Harvard's plans? With sales of its newest drug, Myozyme, soaring, Genzyme is hammering out plans for a $125 million expansion of its North Allston plant. The proposal, set to receive City Hall’s approval next week, would add another 115,000 square feet to the existing 180,000-square-foot drug-making complex. Construction could start soon on that first phase, officials said. Meanwhile, the biotech giant is now eyeing plans for an even larger future expansion. While the proposal is still tentative, the company is exploring whether to add another 170,000 square feet of new manufacturing space and parking to its North Allston drug plant. Where else would the story end this way? "The students not taken to hospitals were brought to a nearby Brazilian barbecue restaurant and given water and snacks." Boston - Brighton bust nets $1 million in cash and drugs - Town Online: "State and federal officials descended on a quiet Oak Square street and left with 125 pounds of marijuana, $500,000 in cash and four suspects in one of the largest drug busts ever in Brighton." On April 19, 2007, eighteen photographs were stolen from an exhibit documenting Palestinian children’s journey to Jerusalem, the sea, and their ancestral lands. The exhibit, which opened on April 14, was hanging in the Honan-Allston branch of the public library, and was scheduled to remain there until May 25. While the thieves of the artwork are unknown, Birthright Unplugged organizers suspect that the motives were political. The Honan-Allston library confirms that this is the first time a theft of this kind has happened there, although they often display art exhibits. 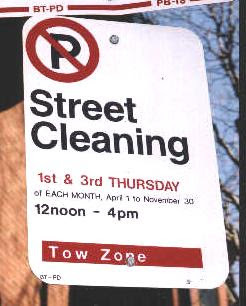 Street sweepers are back, but what do they sweep? I'm not sure if I am happy or not to see the spring return of the street sweepers to our neighborhood. On one hand, anything that makes this place cleaner is great to see. But when the sweeper goes down streets lined with parked cars it really doesn't accomplish much of anything. Even if we don't want to have parking restrictions to let the sweepers get to the curb where all the trash accumulates, there must be a better way. Elsewhere in Boston, people do manage with bi-monthly no parking. There is even an online service from Boston.com that sends email reminders to help people remember when to move cars to avoid tickets - http://bostonsweeper.boston.com/. Harvard Professor Edward Glaeser writes in today's Globe about the urgent need for more housing to be built in Boston. He cites statistics (Boston's 1.4 percent growth rate in a recent Census report was slower than 277 other metropolitan areas, Boston's median home price of $400,000 is more than twice that of other large cities, the cost of living is 50% higher in Boston than in Houston) and concludes saying that more people should live in Boston but that can only happen if we permit more housing. to 2,800 new housing units in North Allston. Harvard has acres and acres of land sitting dormant in North Allston that it doesn't seem to know what to do with. Wouldn't it be great to see some of this new housing that everyone seems to agree we need? This is a great story about the successful revitalization of the South End. I certainly remember it from when I was growing up as a place that seemed to have lots of problems (crime, drugs, etc.). This story tells us about $571 million invested in the Washington St area, 160,000 square feet of new commercial space and 57 new businesses, MBTA Silver Line access to downtown, new housing with more, not less, affordable housing, and strong support from the Mayor. All this sounds a lot like the North Allston Strategic Framework's vision for Western Ave and Barry's Corner. But what is happening there? Not much. Because it seems nothing will happen there until Harvard decides it wants something to happen. "We have the potential to be really good stewards of property," said Kathy Spiegelman, chief planner for Harvard's Allston expansion. She added, "I think most people, if you go on Western Avenue, would agree that there are lots of opportunities for improvements. And the message I hear from people in the community and business people is, 'Get to it. Don't let it languish.' "
So when is Harvard going to get to it? How many more years will you continue to let Western Ave and other parts of our neighborhood rot away? "While we would never encourage Harvard or any other institution to acquire property simply for the purpose of land-banking it, it's not a terrible situation ... to be dealing with a smaller number of landowners as we talk about redevelopment of this whole area," said Gerald Autler, the BRA senior project manager assigned to Harvard's expansion into Allston. And actually, some people in Allston do think it is a terrible situation to be dealing with one major landowner who shows no interest in redeveloping this huge stretch of land in middle of our neighborhood. More than 5,000 supporters are expected to attend the fund-raiser at the Agganis arena, where Obama will make his first public appearance in the state since he announced his candidacy for president. The doors to Agganis Arena — which typically hosts sporting events, concerts, and trade shows — will open at 6 p.m. Inside, the venue will be decorated with American flags and bright banners bearing Obama’s name. A male a capella group from Tufts and a dance troupe will perform before Obama takes the stage at about 7 p.m.
"The Boston Breakers will be among eight teams in women's professional soccer league set to begin play in April 2008, it was announced Wednesday... The Breakers could return to Boston University's Nickerson Field or play at Harvard University." Roger Boothe presenting Negotiating a Livable City: The role of architecture, zoning and site design in the re-development of Cambridge. Roger draws on his more than 28 years as Director of Urban Design with the City of Cambridge. Specific examples drawn from Kendall Square, University Park and North Point. Click here to download more info about hearings for properties on Cambridge St, Comm Ave, Kilmarnock St, Western Ave, LaRose Place, Margo Rd, Union St, Montfern Ave, and Brighton Ave. This person is completely right about the horribly long wait times we can have in Allston and Brighton when an ambulance is needed. I have had personal experience with this when an elderly neighbor had a vein burst that resulted in significant bleeding. The firemen arrived in a reasonable time, but it felt like a 1/2 hour wait at least for the ambulance to arrive to take him to the hospital. My wife recently saw a similar problem when a woman fainted at the Brighton YMCA. Getting sick or injured people to a hospital in a reasonable period of time seems to me like a very basic city service that we all should be able to depend on. This Globe story uses 2004 IRS data to show the % people in each zip code who earn $100,000 or more. The Boston average is 11%. An architect designing the Science Complex said the buildings will utilize innovative heating and cooling systems that will allow the building to use at least 50 percent less energy than comparable buildings. When finally the weather warms up and the rain stops, the noise from parties and people who have had a few too many will probably increase. The Boston Police "party line" is 617-343-5500 which will be nice to have instead of having to call 911 to report noise disturbances. Build Your Campus in 3D Competition! Welcome to the Build Your Campus in 3D Competition! Google is offering a 3 day trip to Google's Mountain View headquarters to the team of students that does the best computer model of their school's campus. Maybe an enterprising group of Harvard students will model Harvard's current and proposed Allston campuses. I'm working on such a model myself, but unfortunately I am not eligible for this contest (students only). Menino seeking big boost in budget - The Boston Globe: "Mayor Thomas M. Menino is proposing the largest increase in the city's operating budget in more than five years, including an additional $6.9 million for the Police Department to upgrade fingerprinting and ballistics equipment and add 100 officers. The proposed budget of $2.3 billion represents an increase of $134.7 million, or 6.2 percent, over the current year and includes a wide array of initiatives, such as teacher education and mentoring, foreclosure prevention, and small-business loans. But most of the new funds are focused, directly or indirectly, on improving public safety as the city faces a surging number of homicides." Is this what Harvard's Science Complex is going to really look like? Of course not! 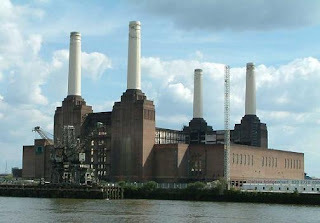 This is the Battersea Power Station. You might recognize it from the cover of the Pink Floyd album "Animals". But many people at last night's Harvard Allston Task Force meeting were suprised to see Harvard present drawings showing several 28' tall smokestacks on top of the buildings of the Science Complex. I don't have copies of these images to share (Harvard wouldn't give out copies of the images last night, but said they would be posted to http://www.allston.harvard.edu/) but here is the south elevation view of the complex from Harvard's Project Notification Form filed a few months ago. It is true that this image shows smokestacks on top of the building but they don't look like much and they seem to blend in with the sky and the birds in the sky. What was shown last night looked much more industrial. These smokestacks, on top of the exhaust fans and other mechanical equipment, would be 135 feet above the sidewalk. The question was also asked what types of gases or fumes would come out of these stacks. The architect assured us that it was all perfectly safe, but if it is so safe, why does it need to be released so high in the air? There are lots of chemicals that people once thought were safe (lead paint, asbestos, etc.). Will the residents of Hopedale St, Rena St, and elsewhere consider this to be a great neighbor to have in their backyard? the neighborhood at a meeting of the Harvard Allston Task Force last night..."
Next meeting of the Task Force is Monday, April 9 at 6:30 at the St. Anthony's School on Holton St. Agenda includes follow-up from last month's subcommittee meetings about Science Complex design, roads (Rena, Windom, Stadium Way), and construction mitigation. "Everything that Beacon Hill neighbors deplored about the Somerset Street proposal -- building size, location, student density -- is addressed for the better in the new proposal. The proposed dorm at 10 West St. would utilize an existing eight -story building and accommodate 270 students, about half the number planned on Beacon Hill. And unlike Beacon Hill, there is a dearth of night activity in Downtown Crossing. Students would make the area both livelier and safer. Mayor Menino and the Boston Redevelopment Authority have given their blessing to the West Street dorm proposal. But they had also backed Suffolk's earlier plan on Beacon Hill. When opposition intensified, however, city officials backed away, leaving the university in the lurch." "I think we're probably doing more in the Northeast region on the whole than in other parts of the country," said Barbara Batshalon, founder of the Green Roundtable, an independent nonprofit group that aims to mainstream green building practices. "There are so many colleges and universities around here, which I think is why the market has accelerated so much. When Harvard starts making noise that they want green buildings, every architect around here is going to look into it so they can start the bidding." Harvard University has certified 20 new-construction and renovation projects for green construction credits under a nationally recognized rating system since 2002, more than any other university in the country, according to Harvard. "The more we do it, the better we get at doing it," said Leith Sharp, director of the Harvard Green Campus Initiative, a university-sponsored operation that employs about two dozen full-time staff members who know about green building design and energy conservation. Sharp said the university spends $100,000 each year on renewable energy research, and purchases enough renewable energy credits to offset about 7 percent of its energy consumption, a move that has been advocated "by students, staff, and faculty alike." ...Sometimes he simply states the obvious. Take the Boston Redevelopment Authority : "The BRA is an advocate for developers and institutions. It is not an advocate for neighborhoods." He controls the Massachusetts Historical Commission in his capacity as its chairman ex officio. If it finds that a developer's plans would have an adverse impact on a historical asset, and no mitigation agreement is reached, Galvin can deny a sewer hookup. As in the toilets won't flush. He's astringent about Harvard and his alma mater, Boston College. "They all have this sense of manifest destiny," he says about the perceived right of universities to expand. There has been talk regarding Harvard's move into Allston of a tunnel below or a bridge above the Charles River so that, in his words, "Harvard students won't get lost finding the new campus." But the Charles, he says, is a historic asset, and if the commission rules such plans would have an adverse effect on the river, remember the toilets. Should City employees be required to live in Boston? municipal workers will make, even if they don't have to. Instead of either holding fast to the residency policy or declaring it unimportant, the administration has decided to split the difference, settling contracts that require municipal workers to live in the city for 10 years, after which they are free to take up residence where they please. The odd compromise gives the impression that you have to "serve time" in Boston, after which you're sprung and can move where you wanted to go in the first place. The founders of the Metro (which is now owned by the Boston Globe) are founding a new newspaper. It will be a combination of traditional news, AP wire stories, and content from local bloggers. Sounds like an exciting way for a variety of voices to provide insight into a range of stories and issues from across the city. Boston preschools falling far short of goals, study says - The Boston Globe: "Boston's public preschool and kindergarten programs are hobbled by mediocre instruction, unsanitary classrooms, and dangerous schoolyards, according to a first-ever study of the programs." Dooley honored at housing dedication - The Boston Globe: "The late Ray Dooley, a top aide of former mayor Ray Flynn during the 1980s, was honored yesterday as the Allston-Brighton Community Development Corporation dedicated a set of affordable apartments in his name. " According to the "Friends of GISB", the German International School of Boston is negotiating a lease for the old St. Anthony's school building at 57 Holton St., Allston. Possible Allston station gains Council support - News: "The Boston City Council threw its unanimous support yesterday behind a plan to install a commuter rail station in Allston, the site of planned expansions from area universities. Councilor Salvatore LaMattina (North End, East Boston), an Aviation and Transportation Committee chairman, said yesterday his committee accepted a $1 million grant from the Massachusetts Highway Department to study potential roadway and traffic management improvements, including the proposed station"
Harvard's Plans a Crimson "Stadium Way"? Is this Harvard's latest rendering of its proposed "Stadium Way" road? 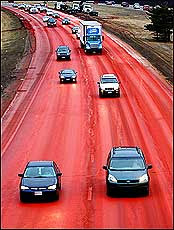 A vision of literally painting Allston crimson? The governor announces plans to build a commuter rail line serving Fall River and New Bedford. Building the line would cost $1.07 billion, and the trains would cost $163 million. Now let's bring a commuter rail stop to Allston! The entire system is broken. Fixing it is essential to cut down on congestion and encourage more companies to locate and expand in our region. More on the story of the Suffolk dorm planned for Beacon Hill that the City stopped last December. The new site at 10 West St. will house about 270 students -- not 550, like the plan Suffolk had pushed for a Somerset Street site on Beacon Hill. This quote brings to mind Harvard's plans for Barry's Corner. The North Allston Strategic Framework makes a clear case for Harvard and community housing in and near Barry's Corner. "It's a great spot," said BRA spokeswoman Jessica Shumaker, "especially because it's going to help with the Downtown Crossing improvement initiative. With the influx of students, hopefully new retailers will want to locate there, and existing ones will want to extend their hours, all adding to a livelier district." The Taste of Allston is coming! This annual fundraiser is an event "that would do the United Nations' annual picnic proud," according to Stuff@Night. Held at the Double Tree Guest Suites, 400 Soldiers Field Road, Allston, the Taste features food from an international array of Allston Village eateries, a cash bar, silent auction, and live music. Save the date: Wednesday, April 25, 2007, for the 10th annual Taste! Tickets are $25 or $200/10 in advance; $30 at the door. CLICK HERE TO PURCHASE TICKETS! There's another new blog in the neighborhood. Harvard Business School can't really have a $55 million landscpaing budget, can it? St. E's: too fast, or what doc ordered? St. E's: too fast, or what doc ordered? - The Boston Globe: "To some residents of Allston-Brighton, a planned $30 million expansion of Caritas St. Elizabeth's Medical Center -- including a new access road, the addition of two floors to the main parking garage, and a new, three-story emergency department -- is too big, too intrusive, and is happening too quickly. But for hospital officials and residents who support the project, it's just what the neighborhood needs, and is all being done by the book."